This cookie was inspired by a pistachio biscotti that my mom makes during the holidays. 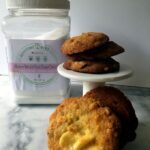 I developed the recipe for orange white chocolate pistachio cookies for a cooking challenge hosted by Langs Chocolates. This post is not sponsored but I was given a three pound container of Keystone Pantry allulose rare natural sugar sweetener for the project. Orange zest keeps these cookies light and fresh while pistachio nuts add a bit of saltiness to the sweet white chocolate. Allulose is a natural sugar-free sweetener but it’s also a bit sweeter than regular granulated sugar. So I wanted a salty ingredient, like roasted pistachio nuts, to balance the sweet of the sweetener and the white chocolate. Something citrus seemed to be in order too, to add a bit of freshness so I added the zest of one orange, roughly two teaspoons. It was a good sized orange but it had thin skin. Allulose is a rare natural sugar ultra-low-calorie sweetener. It has 5% of calories of sugar and about 70% of the relative sweetens of white sugar. Have you ever tried allulose in your baking? Let me know if you try this recipe! 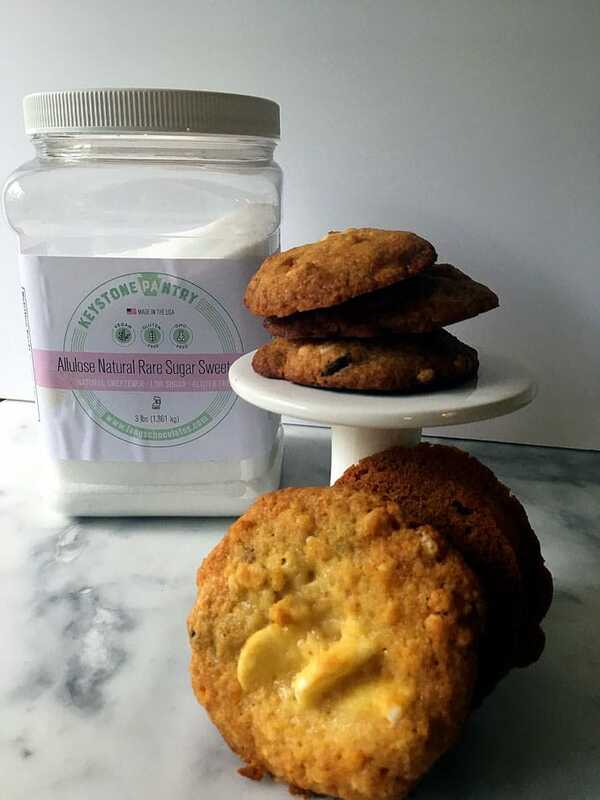 Orange zest keeps these cookies made with a natural sweetener called allulose, light and fresh while pistachio nuts add a bit of saltiness to the sweet white chocolate. Measure the dry ingredients flour through salt and place in a small bowl. Add orange zest and vanilla extract. Blend until combined 30 to 60 seconds. Add sugar and mix on medium speed for one to two minutes. Add egg and beat for another minute. Add white chocolate, pistachio and crispy rice cereal. Mix until just incorporated. Scoop out dough onto plastic wrap and wrap tightly. Chill dough for at least two hours, preferably overnight. Bake at 375 for 12 minutes. Or until the bottoms look golden brown. You can purchase allulose sugar online from Keystone Pantry!